April 1, 2016 – NASA’s Goddard Space Flight Center and Lockheed Martin hosted a roundtable event March 29 at the Lockheed Martin Global Vision Center in Arlington, Virginia. 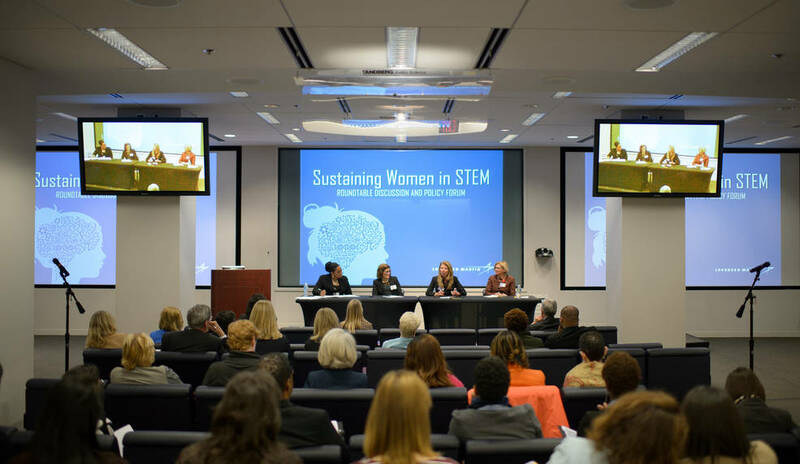 The event, entitled “Connecting STEM Trailblazers: Sustaining Women in STEM,” brought together leaders from industry, government and academia to discuss strategies on how to effectively recruit and retain women in STEM careers. Many organizations have focused on recruiting more women in recent years, but the number of women in STEM remains low compared to that of men. Furthermore, gains made have proven to be difficult to sustain. Though many organizations are seeing an increase in the number of women they hire, some of those women are leaving the positions. The event event brought individuals together to address this issue, as well as problems in workplace policies and practices and organization culture. The event acted as an open forum for issue-driven dialogue, strategies and collaboration among STEM trailblazers. The first portion of the event featured presentations from leaders of industry, government and academia. A few specific topics recurred in presentations and questions throughout the day. One in particular was unconscious bias. Young girls might be deterred from pursuing STEM if they do not see women in those roles in images in popular culture and media. Another prominent topic was confidence among young girls and women. When NASA Deputy Administrator Dava Newman asked the room of attendees if they had ever experienced imposter syndrome, a majority of participants — mostly women — raised their hands. Attendees participated in afternoon workshops to develop ideas, solutions and strategies to enable progress and overcome the retention issue. Participants shared these ideas with one another at the end of the event.